Each of the six sets of tickets is exactly one of the following colors: green, purple, red, yellow. For each line, the January tickets are a different color than the February tickets. For each month, tickets for different lines are in different colors. Exactly one set of January tickets is red. For line 3, either the January tickets or the February tickets, but not both, are green. The January tickets for line 2 are purple. No February tickets are purple. If the line 3 tickets for January are red, then which one of the following statements must be true? The line 1 tickets for January are green. The line 1 tickets for January are yellow. The line 1 tickets for February are red. The line 2 tickets for February are yellow. The line 3 tickets for February are green. If one set of the line 2 tickets is green, then which one of the following statements must be true? The line 1 tickets for January are red. The line 3 tickets for January are red. The line 3 tickets for February are yellow. Which one of the following statements could be true? No January ticket is green. No February ticket is green. Only line 2 tickets are red. One set of January tickets is green and one set of January tickets is yellow. The line 2 tickets for January are the same color as the line 1 tickets for February. Both the line 1 tickets for January and the line 2 tickets for February are green. Both the line 1 tickets for January and the line 2 tickets for February are yellow. Both the line 1 tickets for January and the line 3 tickets for February are yellow. The line 1 tickets for January are green, and the line 3 tickets for February are red. The line 3 tickets for January are yellow, and the line 1 tickets for February are red. One set of January tickets is green. One set of line 1 tickets is red. One set of line 2 tickets is red. The tickets in two of the six sets are red. The tickets in two of the six sets are yellow. Suppose that none of the ticket sets are purple. If all of the other conditions remain the same, then which one of the following statements could be true? None of the January tickets are green. None of the February tickets are green. None of the line 2 tickets are green. No line 1 or line 2 tickets are yellow. No line 2 or line 3 tickets are red. After reading the opening paragraph and rules, we see that this set requires that we match up the January and February tickets for three railway lines with the color of each—a matching set. The action doesn’t become fully apparent until Rule 1 which introduces the concept of the “color” of each set of tickets. Some students were thrown by the notion of “sets” of tickets in the opening paragraph. They were worried that this implied a whole lot of tickets. If we read carefully, though, we know that that’s not a problem. There is one “set” of tickets per month, as simple as that. 1) What color is each of the six sets of tickets? 2) What sets of tickets can, must, or cannot be the same color as what other sets of tickets? 1) gives the information that we’ve already included in the sketch above, namely that each set of tickets will be green, purple, red, or yellow. 2) Let’s take our time and make sure that we fully understand this rule. The January set of tickets of each line (1, 2, and 3) will be a different color from the February set of tickets of that line. Let’s do a “what if” to make sure we have a handle on this rule. If the Jan 1 (January line 1) set of tickets is red, then the Feb 1 (February line 1) set of tickets cannot be red. 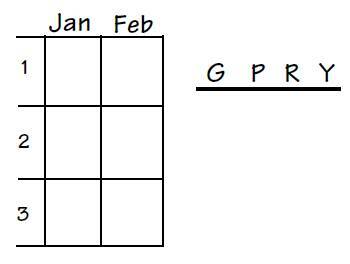 Draw a big “X” between each line’s January and February squares in our grid. 4) Of the three sets of January tickets, exactly one must be red. Build this directly into our grid. Write “ex. 1 R” at the bottom of the January column. 6) Here is a nice, concrete piece of information. The Jan 2 set of tickets is purple. Build this right into the master sketch. 7) Finally, Rule 7 states that none of the sets of February tickets are purple. 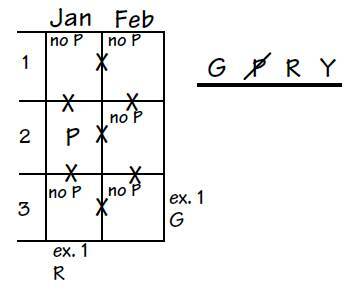 Write “NO P” in each of the February squares in our grid. Rule 6 said that Jan 2 is purple. Rule 3 said that within each month, the sets of tickets for the three lines must be of different colors. So we can deduce that Jan 1 and Jan 3 can’t be purple. Rule 7 already said that NO sets of February tickets are purple, so we definitely know that Jan 2 is the only set of tickets that is purple. We can deduce something else from Rule 7 which says that none of the February tickets are purple. Rule 3 says that each month’s set of tickets must be different colors. Since none of the February tickets are purple, that means that all three of the other colors must be used exactly once for the three sets of February tickets, one green, one red, and one yellow. Rule 5 says that one of the sets of line 3 tickets (either January or February) must be green. The stem says that Jan 3 is red, so Feb 3 must be green, choice (E). What must be true if one of the sets of line 2 tickets is green? Jan 2 is purple (Rule 6), so the only 2 line left to be green is Feb 2. Is Feb 2 green an answer choice? Nope, keep going. Rule 3 says that no two sets of tickets in the same month can be the same color. Since Feb 2 is green, Feb 3 can’t be green. Rule 5 (either Jan 3 or Feb 3 must be green) comes into effect again and Jan 3 must be green. Is Jan 3 green a choice? No, so keep looking. Rule 4 says that one of the January tickets is red, and since Jan 2 is purple and Jan 3 is green, Jan 1 must be red. And that’s choice (A) and the answer. There’s not much to do with this “could be true” question with no new information but try out each choice. (B) Since none of the sets of February tickets are purple (Rule 7), exactly one set of the February tickets MUST be green. (C) The Jan 2 tickets are purple (Rule 6) and one set of the January tickets is red (Rule 4), so either Jan 1 or Jan 3 must be red. (D) Jan 2 is purple, so if one set of January tickets was green and the other set of January tickets was yellow, there wouldn’t be any set of January tickets that was red which would violate Rule 4. (E) Jan 2 is purple, and Rule 7 says that absolutely none of the sets of February tickets can be purple. Another “could be true” question with no new information (but with positive choices, at least—see Bullet Point to Q. 21 above). Again, not much to do with this one but try out each choice. (A) If Jan 1 and Feb 2 are both green, Rule 3 means that none of the remaining sets of tickets can be green. But Rule 5 insists that either Jan 3 or Feb 3 be green. (A) can’t be true and isn’t the answer. (C) If Jan 1 is yellow, the only set of January tickets left to be red (as Rule 4 requires) is Jan 3. Rule 5 then requires that Feb 3 be green, not yellow. (D) If Jan 1 is green, Rule 3 means that none of the other sets of January tickets are green, so Rule 5 again requires that Feb 3 be green, not red. (E) If Jan 3 is yellow, the only set of January tickets left to be red (as Rule 4 requires) is Jan 1. Since Jan 1 is red, Rule 2 doesn’t permit Feb 1 to also be red. If Feb 3 is yellow, Rule 5 forces Jan 3 to be green. Since Jan 3 is green, Jan 1 is left to be red (as Rule 4 requires). Since none of the sets of February tickets are purple, Feb 1 and Feb 2 must be green and red. Since Jan 1 is red, Rule 2 means that Feb 1 can’t be red and must be green. Feb 2 is left to be red. The entire setup is fixed: Jan 1—R, Jan 2—P, Jan 3—G; Feb 1— G, Feb 2—R, Feb 3—Y. The only choice that doesn’t agree with this setup is (E)—only one of the sets of tickets is yellow. For this question, none of the sets of tickets are purple. This doesn’t affect the sets of February tickets since none were purple anyway (Rule 7). But since none of the sets of January tickets are purple (sorry Jan 2, you’re not purple anymore), one will be green, one red, and one yellow. These three colors are the only options for both month’s tickets.